Also Known As: “Throw your belt buckle at the target”. This swing thought encourages you to adopt a position at the end of your follow through that sees your belt buckle facing directly towards the target. This is in contrast to finishing your swing where the belt buckle is seen facing down towards the ground or towards the right of the target. Making sure that your hips are facing the target at the end of the follow through will promote a full weight transfer and will see your body weight resting almost entirely on the left foot, as it should. Furthermore, by forcing your swing to garner enough energy in order to reach that finish position, a proper swing acceleration through impact will be encouraged. This swing key will help you cure any swaying tendencies you may have. It will also help you solve any unwanted open position at impact you may be suffering from. Finally, it is almost impossible to have your hips facing the target at finish if you made a reverse pivot swing. By making you think about your hips this swing thought will get them active and in the process will help you get rid of a series of nasty swing errors. Indeed, sway falsely gives the impression that an upper body rotation actually occurs while weight transfers. Positioning your belt buckle to face the target at finish will absolutely require your hips to turn. Likewise for the reverse pivot swing error. It is almost impossible – and surely very uncomfortable – to have your hips facing the target at finish while your weight rests on your right foot. 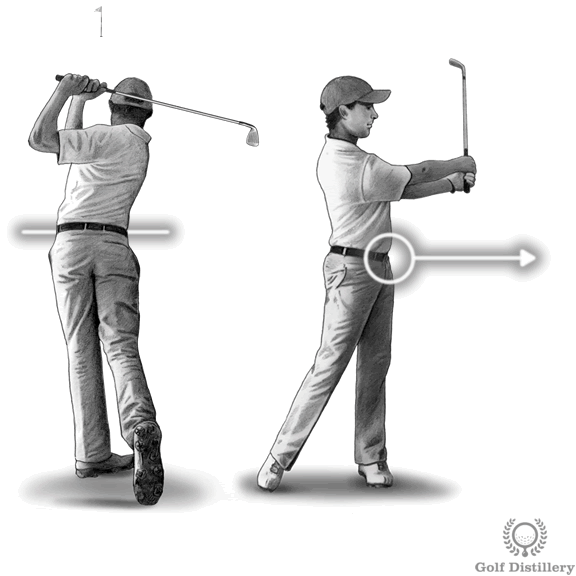 You should aim to position your hips as described here for all shots that require a full follow through.